Many pet insurance companies won't insure cats over a certain age as the likelihood they will require vet treatment increases. While the age of your cat will influence the price of your premium to an extent, it won't affect it quite as much as it would if you had an older dog. Sometimes, policies for older dogs can be several times as expensive as for a dog that is, for instance, one or two years old. Check out our article on 9 companies offering cheap pet insurance for older dogs. However, the premium you pay is still likely to increase as your cat gets older. This can be frustrating, but unfortunately, the likelihood of an insurer having to pay out for a claim does increase after the age of 2. If you're buying pet insurance for a pet before it turns two, it's worth considering our Fixed For Life cover. It never increases in price so it's one way to make sure your premium stays the same when your cat is older. Moreover, not many pet insurance companies offer a good level of dental cover. This becomes more important as a cat ages. Most will only cover your pet if its teeth are damaged in an accident. There are some companies that will offer comprehensive dental cover, however. Have a look at our article on 5 pet insurance companies offering dental cover for dogs and cats for more information. You should also consider the excess or co-payment for older cats. When pets reach a certain age some insurers increase the excess or ask customers to pay a percentage of the claim. This is because older pets are more likely to develop medical conditions and the costs associated with them can be higher. Co-payments range from around 10% to 20% of a claim. With a lifetime product, it is important to note that your premiums will increase each year at renewal. This is different to a “Per Condition” policy, where a particular condition can become excluded once the condition limit is reached. Lifetime Pet Cover offers pet insurance policies that continue to pay out for ongoing medical conditions that occur after the start of the cover. (These are normally called lifetime policies, hence the company's name.) Dental cover is included in its policies. Lifetime Pet Cover offers five different levels of vet fees cover: £1,000, £2,000, £4,000, £6,000 and £10,000. As with most pet insurance for older pets, there is a mandatory contribution the policyholder has to pay for a claim, on top of the excess. Lifetime Pet Cover's excess if £95. If your pet is over the age of 7, you will also have to contribute 20% of the claim, and if your pet is over the age of 12 you will have to contribute 25% of the claim. With our lifetime pet insurance policies, your pet turns 9, a fixed excess of £69 plus 20% of each claim will apply. Get a quote with Lifetime Pet Cover for your older cat. Accident Only This policy offers £2,500 for vet fees, but will not cover your pet for any illnesses it may contract, only for accidents. Basic is a time-limited policy, meaning your pet will be covered for an illness it contracts for either 12 months or up to the vet fees limit. Limits for More Than's Basic policy are £1,500 or £3,000. Classic offers either £4,000 or £8,000 vet fees limit, and is a per condition policy, meaning each illness will be covered separately for each condition. Premier is More Than's lifetime policy, meaning all accidents or illnesses will be covered up to £12,000, with the vet fees limit resetting each year. For pets over 9, you will have to contribute 10% of the cost of a claim, on top of the policy excess of £150. If your pet is under 9, the policy excess is £75. Get a quote with More Than. John Lewis Finance only provides lifetime pet insurance policies, meaning it continues to provide cover for medical conditions each year. 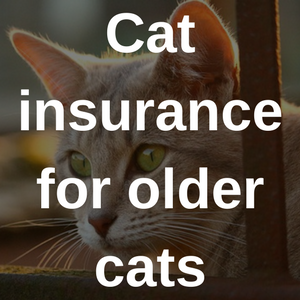 Because of this, its prices for older cats may be more expensive than other insurers'. John Lewis Finance offers three levels of pet insurance: Basic, which offers up to £3,000 worth of vet fees, Plus, which offers up to £7,500 worth of vet fees, and Premier, which provides up to £12,000 in vet fees. For pets over 9, you'll have to pay either 20% of a claim or £500 in excess, whichever is more expensive. The company is currently offering a 10% online discount. Get a quote with John Lewis Finance. Animal Friends provides accident only, time-limited and lifetime pet insurance policies. These range from £3,000 annual cover on its Basic time-limited policy all the way to £6,000 vet fees cover on its Prestige lifetime cover. For older cats, its excess payment is £99 plus a 20% co-payment fee, meaning you pay 20% of any claim you make. Get a quote with Animal Friends here. Most of our policies will cover cats of any age, and we even cover some pre-existing conditions - something no other pet insurance company will do. Our Complete cover is the most comprehensive on the market, offering £15,000 of vet fees cover every year, and includes cover for dental problems as standard. We also have a MoneyBack policy that can pay you back 20% of your premium each year you don't claim. Our comprehensive policies have a £69 excess and for cats aged 9 and over you will also have to pay 20% of any claims you make. This is designed to keep premiums down. We offer a 15% multi pet insurance discount for cats on the same policy. Will Bought By Many cover a cat aged 8 or over? All of our pet insurance policies will cover older cats. In fact, one of our pet insurance policies comes with a no excess option for pets under 9. So if your cat is 8, you'd be able to take advantage of that option. You can learn more here and get a quote. E&L, or The Equine & Livestock Insurance Company, has a specific policy for older cats. The company says its insurance policies start from £10.06 per month, and it offers a 45% discount when buying online. It also offers a 10% multi-pet discount. The company has three time-limited policies to choose from for older cats: Silver, with vet fees up to £4,000, Gold, providing vet fees up to £5,000, and Diamond, which has vet fees up to £6,000. Excess on these policies ranges from £65 to £169, depending on the policy chosen, what breed your cat is and where you live. Claims over £1,000 may be subjected to a double policy excess. Get a quote from E&L for senior cat insurance. The excess on policies is £85. If your cat is aged over 7, you may have to pay 10% of the claim on top of this excess. Get a quote from Debenhams for elderly cat pet insurance. Argos offers pet insurance for older cats. The company's Silver and Gold policies are both time-limited cat insurance policies, with vet fees cover of £2,500 and £4,000 respectively. Its Platinum cover is lifetime pet insurance cover, with a vet fees limit of £7,000. The excess on Argos's pet insurance policy is £65. You can also add a voluntary excess of £25, £50 or £100 to bring down the price of the premium. Get a quote from Argos for older cat insurance. If you have an older cat that has a pre-existing condition, you might struggle to find cover that will cover that condition. Insurers have different definitions for pre-existing conditions. It could be a condition your pet has suffered from in the last 5 years, in the last 2 years or the last 6 years - the exact time period will depend on the insurer. It is important to read the policy documents to understand what each insurer defines as a pre-existing condition. If your cat is seen to have a pre-existing condition by an insurer, any vet fees incurred as a result of that condition will not be covered. We are the only pet insurer on the market that offers to cover pre-existing conditions as long as your pet hasn't had any treatment or advice for that condition in the three months before the start of your policy. You can learn more about our Pre-existing pet insurance policy here and get a quote for your cat. "We have multi dog insurance with bought by many..... through more than and its easy! And have claimed for one of them and they were amazing!" Check out our pet insurance group for older pets. Or, take a look at our article on pet insurance for older dogs. What does cat insurance cost? Some dogs and cats are luckier than others, but does their name make a difference?